(Stage 29-33): 8 days, 127 km's pilgrimage (100 miles). A great taste of the Camino. Last chance to gain the 'Compostela'. Camino de Santiago Light starts in Sarria, 115 km. east of Santiago de Compostela. It's the minimum distance requiered to apply for the Compostela Certificate. Perfect for those looking to capture the essence of the Camino. It's a magical stretch, and chances are you will want to return to do it again. The distance is just long enough to draw you into the enchanting world of the Camino with its monuments and once in a lifetime experiences to be enjoyed ad libitum and with many exciting people from all over the world that you will unavoidably meet on this journey. Explore the magic of Santiago’s Old Town, a UNESCO World Heritage Site. The price includes picking you up in Santiago or La Coruña Airport (please ask for quote with airfare). From there you will be transported to your hotel in Sarria. You can use your time in Sarria to relax or or taking a taxi to Samos, to see one of Western Europe's oldest and largest monestaries from which you can walk the 11 kms. along the Camino back to Sarria. In Santiago you also have two nights. Here you will spend the day on a magnificent guided daytrip to Finisterre - the "worlds end." This amazing coastline is full of legends and breathtaking views (English speaking guide provided). ✔ Daily Departures all year round. ✔ Dividing stages: Yes, always! The stretch throug Galicia from Sarria to Santiago is the most popular and by far most used Camino-section, which can be clearly seen by the number of pilgrims on this route. It's very charming to come into contact with people from around the world, all of them walking in the same direction and with the same goal in mind. Sarria is 115 km east of Santiago and is the minimum distance required to walk to obtain the Compostela of Santiago. Sarria, is also a good starting point for the Camino because there are bigger towns with all the necessary facilities you might need along this route. On this route there are two really exciting excursions, one to the huge monastery of Samos, from where you can walk back along the Camino to Sarria, and the other to Lugo and ahead to the world's best preserved Roman city wall. The first stages after Sarria are fairly hilly, but also some of the most idyllic on the whole Camino. Many have said that these stages are their favourites of the entire Camino - it is so beautiful. You'll pass small farming communities, with stone houses and cobbled paths, you'll walk along the fields where cows graze and through forests where all you hear is the river's murmur. Nature is the main attraction along this way until reaching Santiago de Compostela. This stunningly beautiful town exudes atmosphere in the Old Town's sector of winding streets. It's the perfect ending to your Camino de Santiago. Service functions are generally very good. Possibility of dividing stages: Yes. Day 1.- Arrival to Sarria. You will be picked up by our own driver in Santiago airport who will drive you directly to your hotel in Sarria. Upon arrival to Sarria its possible to take a taxi / bus (info shown in the enclosed guidebook) 11 km. in the opposite direction to Samos and monastery. The beautiful old monastery is one of the largest and oldest in the western world and is a good starting point for the trip. The route from Samos to Sarria is hilly and very beautiful. Or simply just relax in Sarria. Manybe choose to add another night in Sarria to do the walk from Samos the day after, or/and to visit Lugo, where you will find the best preserved roman citywall in the world. 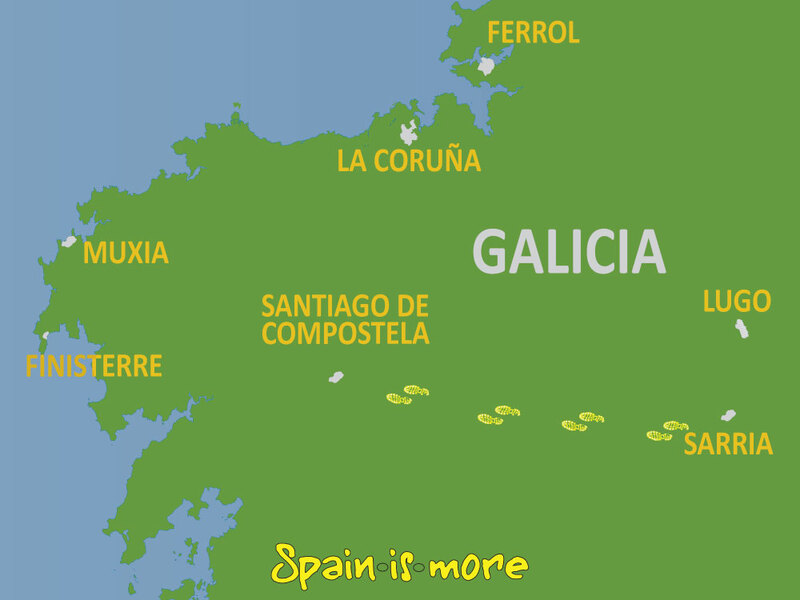 Galicia is one of the most beautiful regions in Spain, both in nature and glorious tradition. Today’s walk is one of the most attractive stages of the entire Pilgrim’s Way; traveling through authentic rural Spain and its verdant forests, grassy meadows, fertile orchards and simple stone-built hamlets. The terrain becomes flatter, though still hilly. Optimism takes over in this magnificent, lush area. By now your goal feels achievable. The journey continues along farm tracks and quiet country roads through the lush Galician countryside to Palas de Rei. Palas de Rei is a small village of around 2,000, with an illustrious past, although nothing remains today as a reminder since the historic city was engulfed in 1960 with the water from the dam and lake that were built. NOTE: the two stages between Portomarin and Arzúa can be divided into three stages with the following km. distribution: 17, 16 and 20 km. Today's views will seem somewhat familiar. A typical day on the Camino de Santiago, through rolling green landscapes, dotted with cows, stone walls and tiny Romanesque churches. Take time to talk and learn about myriad of legends and stories that this route offers. Today´s stage can also be divided into an extra night in Melide. NOTE: the two stages between Portomarin and Arzúa can be divided into three stages with the following km. distribution: 17, 16 and 20 km. Or we can just divide the long stange between Palas de Rei and Arzua in two stages. An exhilarating atmosphere unfolds as your journey's end draws closer. Pilgrims now feel the close joy of having reached their goal and they begin to revel in happiness and relief with the many companions they met along the way. Today’s walk is along natural pathways through tall groves of Eucalyptus that provide superb shade during your walk. Along with the rituals, enjoy the End Station of the Pilgrim Route, Santiago de Compostela, which offers a veritable cornucopia of attractions and one of the world’s most important cultural centers. This university town exudes charm and has a myriad of cozy streets offering ample opportunity to sample the many local delicacies. The Cathedral is surrounded by a historic center which is on UNESCO’s World Heritage Site list, and its old town is incomparable to any other. Its monuments stand as true works of art in different architectural styles. From 525 EUR/pers. Per person in a double room. 7 nights in a double room - always with private bath/toilet. Transport from Santiago de Compostela airport directly to hotel in Sarria. Baggage Transport on the pilgrim route can be purchased. If you buy a luggage service your bag / suitcase will be transported from hotel to hotel on the scheduled days of hiking. Price 75 €/unit of max 20 kg. Extension of stay in Madrid, León and Santiago de Compostela can be purchased.